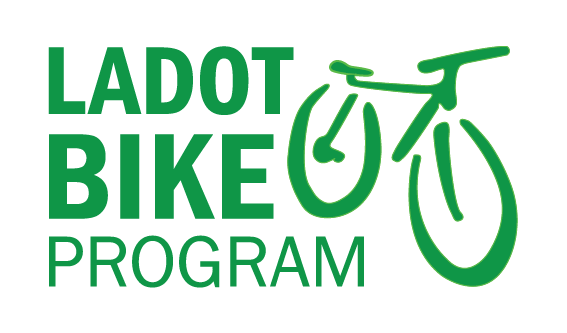 UPDATE: There will be an Open House tomorrow (5/30/2012) between 5:00PM and 8:00PM to discuss the upcoming Downtown Bikeway Network. The event will be held at Aiso Plaza (Judge John Aiso Street & 1st Street). For more information, click here. First St. at the last CicLAvia. This stretch will have bike lanes in the next two months. We hope everyone had a great Bike to Work Day! Special thanks to all the riders and pit stop volunteers that made the week’s festivities possible. Hope everyone got to enjoy their Cliff Bars and other promo items at the various pit stops! Just a year ago, Downtown Los Angeles was devoid of any dedicated bicycle infrastructure. Last April, the 7th Street bike lanes brought the first dedicated bicycle facility right to downtown’s doorstep. Then in late November, the highly anticipated southbound Spring St. green bike lane brought the first true bikeway to the heart of downtown Los Angeles, connecting Chinatown, the Civic Center, and the Historic Core to the edge of South Park. This past February, Main St. joined the fray, extending the Spring St. bike lane southwards between 9th and 16th/Venice Blvd with a two-way facility. 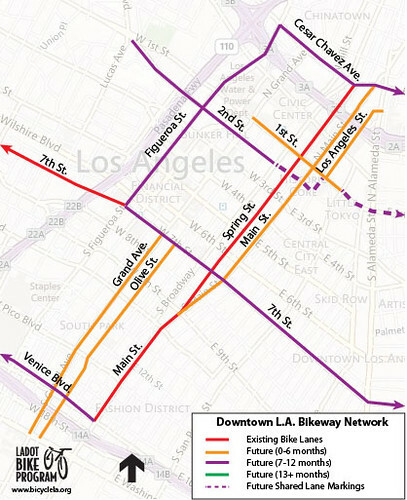 We’re happy to report that within the next three months, LADOT will be installing the highly anticipated complimentary northbound lane to Spring St. on Main St. from 9th to Cesar Chavez, giving Downtown L.A. a true north-south backbone for its burgeoning bicycle network. While Main St. is an important facility, it is just another piece of the downtown Bikeway network coming together. Within six months you can expect Los Angeles St. to get bike lanes from Alameda St. to First St, providing a direct bicycle connection to the region’s preeminent transit destination, Los Angeles Union Station. The lanes on Los Angeles will be complimented by new lanes on First Street between Grand Ave. and San Pedro St. The First Street bike lane will connect with the Spring St. and Main St bike lanes, as well as the Metro Red/Purple Line Civic Center Station, LAPD Headquarters, City Hall, LADOT, and the Music Center. Further west and south, Olive St. and Grand Ave. between 7th St. and Washington Blvd. will also be getting bike lanes. An analysis of the traffic patterns there revealed that Olive and Grand were ideal candidates for bike lanes because they have more than sufficient service capacity for existing traffic volumes. This allows us to implement the facilities without any significant impacts. Olive and Grand will be installed as a couplet (Olive will have a northbound bike lane and Grand will have a southbound one). They will connect with future facilities along 7th St., 11th St. and Venice Blvd. (more on these facilities below). Seven to 12 months out, projects covered under the scope of the Environmental Impact Report (EIR) Package One list will proceed through the review process. 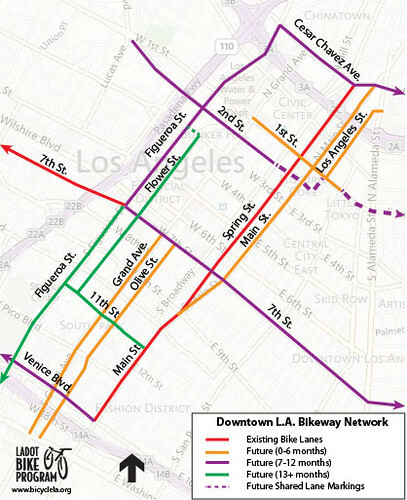 Projects included in this list include the ever popular 7th St. bike lanes that would continue existing facilities eastward through downtown from their current terminus at Figueroa St. to Soto St. out in Boyle Heights. Figueroa St. east of 7th would also get bike lanes to Cesar Chavez Ave. Cesar Chavez would get bike lanes from Figueroa St. to Mission Rd. A very exciting connection for communities to the north of downtown will be on 2nd Street, which would stretch from Glendale Blvd. to Broadway and utilize the 2nd Street Tunnel to get bicyclists directly into downtown. The 2nd Street facility wouldl also connect with bike lanes on Main St. and Spring St. Venice Blvd. 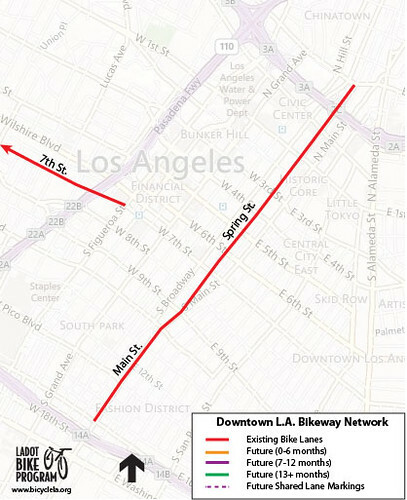 would also be getting 4.5 miles of bike lanes from Main St. to San Vicente Blvd, creating a nearly 13 mile long bikeway that stretches from Venice to Downtown L.A. (Be sure to express your support for these projects to your council member). 13+ months from now, we can look forward to the MyFigueroa project along the Figueroa corridor, stretching from west of 7th St. in Downtown L.A. through South Park and onto Exposition Park. Projects on 11th St. and Flower St. (awaiting construction to finish on the Regional Connector Project) will further build out the downtown bikeway network. Be sure to tell us what you think about these projects in the comments section below. Can’t wait until 7th St. gets put in (through Skid Row, that is)! Yay for bike lanes DT! After these improvements there will still be a gap on Sunset Blvd. between Figueroa and Douglas. The same for the 2nd St. lane to Glendale Blvd–it leaves a gap between 2nd and Sunset. Without bridging at least one of these gaps, there is no integration of bike infrastructures between Hollywood and Downtown. For less experienced riders, these two intimidating gaps may dissuade them from commuting by bicycle. 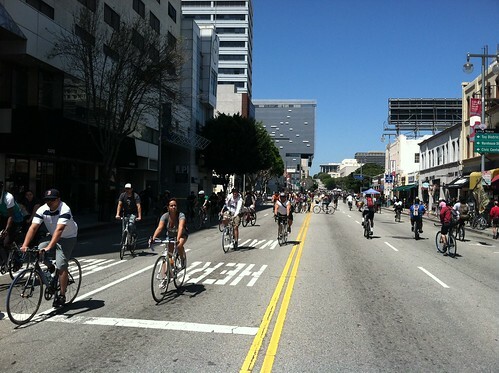 Hopefully, Main St and 1st St will get bike lanes before the next CicLAvia. These streets were both on this years CicLAvia route. Having bike lanes should give some people, who ride in the event, ideas of how to get around downtown by bike on a workday. Additionally, adding bike lanes on Grand, Olive and Los Angeles St before the Bike Nation bicycle sharing system is in place will help encourage people to try these rental bikes and many of them may also decide to start using their own bikes to get around downtown on a workday. After the first year that the large Velib bicycle sharing system was introduced throughout Paris, the private use of bikes doubled in this French city. Downtown LA has got a lot of potential for increased bicycle use. Afterall, the police dept has been using bikes there, DOT gives out parking tickets by bike, there are bike messengers, private bike patrols by some business districts and even Domino’s Pizza delivers by bicycle. Do these come with a repaving of the road? Bike lanes are all well and good, but if they are on treacherous surface, then it doesn’t really matter. Overall this looks very good. With short distances between destinations, and plenty of transit connections, Downtown is a critical place to make safe and welcoming for bicycling. Hopefully, over time, this network will connect well with adjacent population-dense communities of color, too. Many of the facilities in the city’s 5-year implementation plan will make those connections – facilities including Central Avenue, Venice Blvd – more 7th Street and First Street, too. Is the full list of bike lane facilities being studied in the initial Environmental Impact Report already posted anywhere? If not yet, can it be made publicly available? This is amazing news! This is an indicator that the quality of life in DTLA is improving. 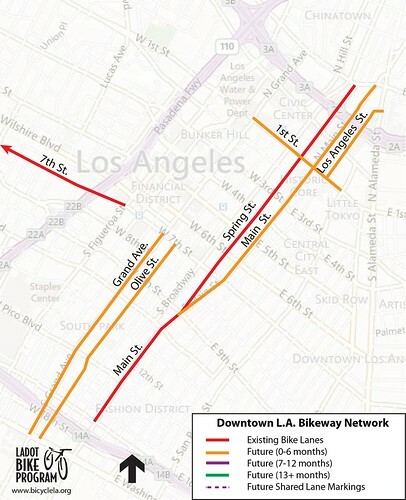 on May 31, 2012 at 7:02 am | Reply New Downtown Bike Lanes Coming June 2012 « B.I.K.A.S.